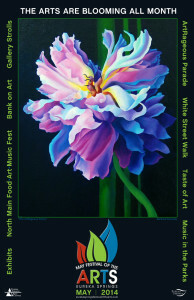 Every year in the spring Eureka Springs celebrates the creative uniqueness of hundreds of artists who call Eureka Springs home. Fanciful parades, colorful shops, gallery walks, creative cuisine, and live music in Basin Spring Park are just some of the events that introduce visitors to the fine art of fun. Park at the top of Planer Hill and ride the trolley around town. It is a great way to get acquainted. Keep your eye out for several of the public art pieces displayed throughout town. Grab a gallery guide so you don’t miss any art galleries in town. Watch for special openings with wine and cheese receptions in May. Many places to stay overnight are historic. Get a complete list of Bed and Breakfasts and historic hotels on EurekaSprings.com. 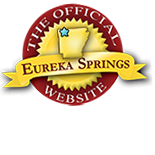 Find fantastic shows and other great Eureka Springs attractions. This entry was posted on April 20, 2014 by estcblog in Arts & Culture, Attractions, Basin Park Hotel, Culinary Adventures, Eureka Springs Lodging, Fun Downtown and tagged Arkansas, art galleries, downtown, Eureka Springs, Eureka Springs Arkansas, Fine dining, history, local culture, May Festival of the Arts, Top 25 Arts Destination.